THE Caledon/Coalisland 1968 Group has been working over the past several months to commemorate the 40th anniversary of the ‘Caledon Squatting’ and the first Civil Rights march from Coalisland to Dungannon. Throughout the history of the Northern state there existed housing conditions of extreme poverty. Communities struggled in vain to get adequate good-quality homes for families. The system of house construction and allocation was riddled with injustice and discrimination. It is almost impossible, 40 years on in 2008, to imagine the terrible living and housing conditions that so many families endured at that time, conditions from which there was so little hope of escape. In desperation at this news, local nationalists decided the time had come to make a stand. Mrs Gildernew, whose family were deeply involved in these events, went on to describe the reaction among members of the nationalist community. “A meeting of the Brantry Republican Club was joined by Seán Hughes, a Dungannon journalist, and Fr McGirr from the local parish. A decision was reached that houses in the newly-built estate would be squatted in protest. For the times that were in it, such a move required great courage and conviction – fear of extreme loyalist reaction was well justified. 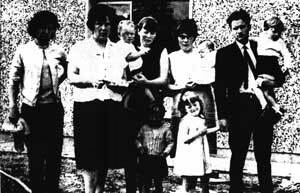 And so, in October 1967, two nationalist families took possession of homes by squatting. Mrs Gildernew, a member of the Caledon/Coalisland 1968 Group, recalled how events developed further. Little did anyone realise the chain of events that would follow the family being carried and pulled from their home. The result was a campaign that would not be just local but international. It highlighted the terrible injustices of the Northern state: discrimination in housing, jobs and many other parts of life. This would be the struggle for Civil Rights and the removal of all vestiges of second-class citizenship for nationalists in the North. The campaign gathered great momentum when, two months later, on Saturday, 24 August 1968, the first march for civil rights took place from Coalisland to Dungannon. The march highlighted housing and social injustice in a truly historic way. The Caledon squatting and eviction and the Coalisland to Dungannon march provided the sparks that were the beginning of the campaign for civil rights. The Caledon/Coalisland 1968 Group has assembled a programme of events to recognise and commemorate the events of that historic year. ‘Caledon – Before and After’, an exhibition of memorabilia, sound and video recordings, will be on display in the Cornhill Heritage Centre in Coalisland from Friday, 13 June to Wednesday, 18 June. The exhibition will vividly recall memories of the Caledon squat and the events that followed. All from across the communities are invited to come along to this. Another highlight takes place on Saturday, 14 June, when an open Questions and Answers Discussion Forum will be held at Craic Theatre in Coalisland. The forum, chaired by UTV’s Fergal McKinney, will feature a panel of prominent public figures from across the political spectrum. • Anyone wanting information about seat availability for the Q & A Forum can contact Craic Theatre at 028 8774 1100.